It should be said at the top: SICARIO: DAY OF THE SOLDADO is a perfectly fine movie. Flawed, to be sure, but a surprisingly adequate sequel that thrills in similar fashion to the original. It’s entertaining, at times defiantly too large in the scope of its own world and in its own franchise (if that’s what this is now), but for the most part it’s an engaging enough watch. Yet not since WALL STREET: MONEY NEVER SLEEPS has a film’s existence been quite so baffling. An a-typical choice for a franchise, it stands as some act of movie development defiance for reasons that are somewhat unclear. By justifying the film’s existence through the guiding principles of journalism, the who, what, where, when, why, and how, it becomes even more muddled. Let’s start with the easiest one: “What.” DAY OF THE SOLDADO is a sequel to the 2015 film, SICARIO. With an awards-friendly October release date, the original film would go on to earn a 93% on Rotten Tomatoes, grab three Oscar nominations (Cinematography, Sound Editing, and Original Score), and be generally considered one of the best movies of 2015. Asking “what” SICARIO: DAY OF THE SOLDADO is really fails to acknowledge the film with any depth, so for that let’s turn to “who,” the question of what separates this film from its predecessor more than anything. The original lead, Emily Blunt, is nowhere to be found here. Same goes for a creative team whose presence defined the film, including director Denis Villeneuve, director of photography Roger Deakins, editor Joe Walker, and late composer Jóhann Jóhannsson. Joining Josh Brolin and Benicio del Toro in a quasi-buddy cop border drama are mostly unknown director Stefano Sollima and frequent Ridley Scott collaborator Dariusz Wolski. Without question, the “who” of DAY OF THE SOLDADO is what craters much of the film’s potential. Outside of scenes with either of the two leads, whose wildcard magnetism is in rare form here, the cast is competent but sometimes flat, particularly the normally great Catherine Keener, who plays her role as a government higher-up with a dry boredom. Sollima gets a great performance out of child actor Isabela Moner, but his presence is mostly on autopilot here, allowing Brolin and del Toro to go nuts but the rest of the film to feel somewhat loose. The pacing and the tone often feels out of line with the original, partly because of the unnecessarily larger scope and partly because we lack a true grounding to both Brolin and del Toro’s anything-can-happen energy. 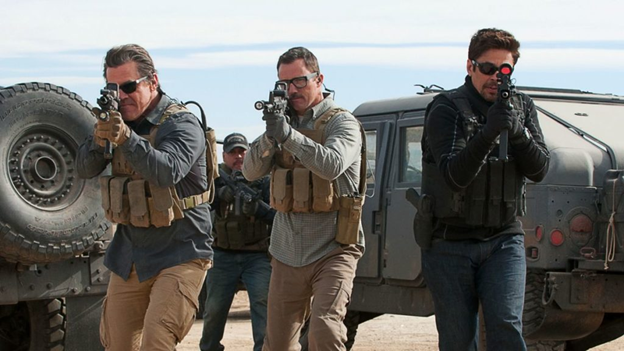 Wolski’s attempts to replace Deakins are admirable, but while SICARIO was a treat for the eyes, one of the best works of Deakins career, Wolski’s camera struggles between the twitch of a modern war film and the subtle engagement of the original film. “Where” is also a minor setback. While the film takes place in the same Southwest border towns of the original, its opening moments take us to Kansas City and South Africa, attempting to offer a global perspective and a shift from the macro world affairs landscape to a relatively micro story about a young girl being used in a devious game of geopolitical chess. 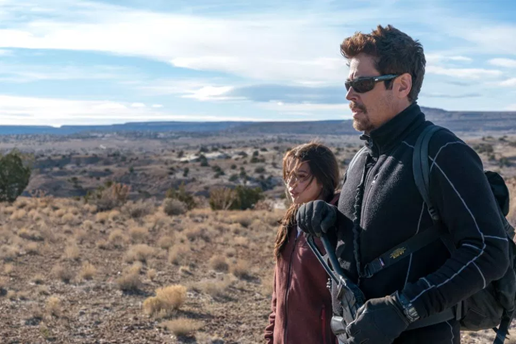 The Sicario franchise is filling a void that FX’s THE BRIDGE left behind and, truthfully, when the film finally returns to a sense of simplicity in the vastness of the Mexican desert, it works. Nonetheless, in today’s current political landscape, watching a film where US operatives kidnap a child from a Mexican cartel boss while pretending to be a rival gang, only to inadequately misplace her and fail to return her to her parents, that trip through the desert is too bogged down by real world current events. But “where” and “who,” even with their problems, never really justify the “what,” so for that we turn to the “how.” Screenwriter Taylor Sheridan (SICARIO, HELL OR HIGH WATER, and directorial outing WIND RIVER), whose enthusiasm for a sequel seems to match Brolin and del Toro’s, has developed an expanded universe (there will be a third film), a franchise that looks to tell stories about the US government’s manipulation and corruption when it comes to US-Mexico border relations and illegal immigration. Make no mistake though, it was Brolin’s and, eventually, del Toro’s interest and eventual sign on that led to this. Going forward, the potential for anthology-esque stories about this issue are, at least theoretically, interesting—Brolin has already expressed an interest in making more, and his Matt Garver and del Toro’s Alejandro Gillick are both compelling anti-heroes to carry a lot of ground. But what would’ve inspired a return to this kind of story in the first place, especially as a sequel, is inexplicable. Nonetheless, their sign-on had to have impacted the “when,” a baffling middle-of-the-summer release date where the film has had to compete with ANT-MAN AND THE WASP, JURASSIC WORLD: FALLEN KINGDOM, and THE INCREDIBLES 2. The original film made $89 million globally on a modest $30 million budget, a fair haul but hardly a box office smash, and it did that in mid-September. The development of a sequel as a shoot-’em-up action film, which is what most of the marketing surrounding the film falsely suggested, is mind-numbingly odd. Certainly the film delivers some tense action sequences, arguably an area where as a whole it surpasses its predecessor (including some amazing Black Hawk helicopter moments), but to market this film as a popcorn run-’n-gun is patently false. And that leads us to “why.” Why the name change from SOLDADO to DAY OF THE SOLDADO? Why give it a false ending that sets up yet another SICARIO film rather than give yourself a clean out? Why not try and retain your creative core? Why falsely market this film? Why make this movie? If you focus on that last question, you’d go mad. After all, without any of the filmmakers that made the original one of the great political action thrillers of this millenium, and a fairly low ceiling for box office potential, the sheer reason for DAY OF THE SOLDADO to exist defies logic. To shift back to a different “who” question for a moment, I’m not sure who exactly was clamoring for a return to this franchise beyond the screenwriter and perhaps the talent—certainly not awards voters, and if box office numbers are to be taken as a sign of endorsement, apparently not casual moviegoers either. Even as a better-than-you’re-expecting film, DAY OF THE SOLDADO across the board fails to justify its own confusing existence. One Year Later: Is BOYHOOD As Terrible As I Remember?